Peach and Cinnamon Cobbler - I Am Proud Of My Kids! This mouth-watering dessert is filled with Southern joy. If you are serving this warm, bring along some Vanilla ice cream. You’ll have the family chasing you around the dinner table for the recipe! Preheat oven to 350°F. Butter a 2 1/2-quart baking dish. In a medium bowl, stir together the filling ingredients. Pour filling into the prepared dish; set aside. mixture resembles coarse crumbs. Slowly add the 2/3 cup cream, mixing until the dough just comes together. Turn the dough onto a lightly floured surface and pat together. Form the dough into 2-inch balls. Flatten balls gently with the palm of your hand. Evenly arrange the dough rounds on top of the filling. Brush a little cream over the rounds. Bake about 1 hour or until the biscuits are golden and the filling is bubbling. 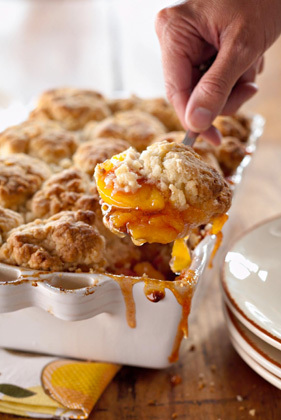 Be the first to comment on "Peach and Cinnamon Cobbler"